sitting on my pantry shelf. When I started the summer I had 200 empty canning jars on my shelf. I used up every single one this summer. Our fruit trees did really well this year, as did our garden and my uncle's garden. We had produce, especially cucumbers, coming out of our ears this summer. 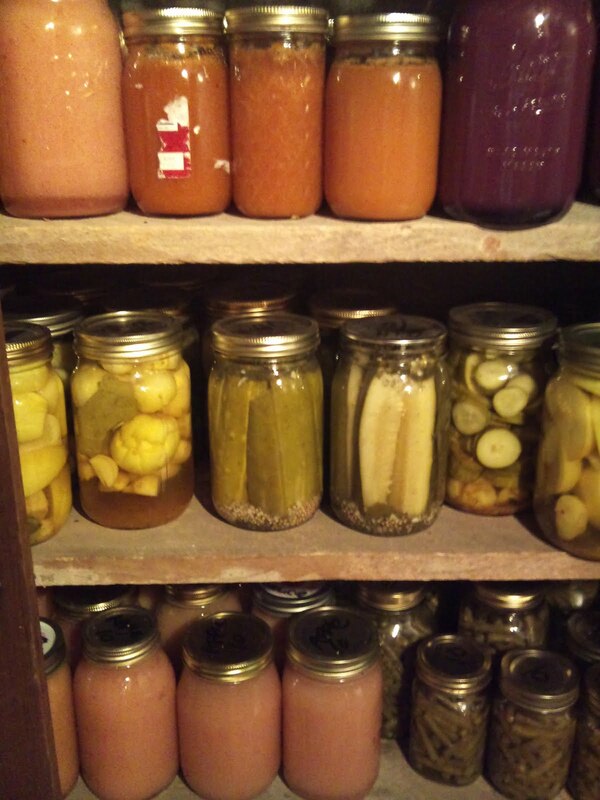 For some reason knowing the work and labor that went into each jar always gives me an sense of indescribable joy. Yet because I know how much work each one of those jars took I also mourn the loss of one of those jars every time we eat. I tend to guard those jars passionately making sure that nothing I worked to preserve is wasted or unappreciated. As I was counting my jars I realized that there were only 94 jars on my shelf. I think my family has probably eaten the contents of about 20 other those jars since the start of fall. So that means there are 86 jars missing from the 200 I started with. Where did those 86 jars go? As I thought back on my summer I realized that every time I made a new batch of pickles, salsa or apple sauce I gave it away to friends and family almost as fast as I made it. I was so proud of what I had done that I wanted to share it. I felt so blessed to have so much abundance and it gave me joy to share the work of my hands. With each jar I sent out I was sending out a little piece of myself. It surprises me now to realize that, without me evening being aware of it, I gave away-- so easily-- 86 precious jars. 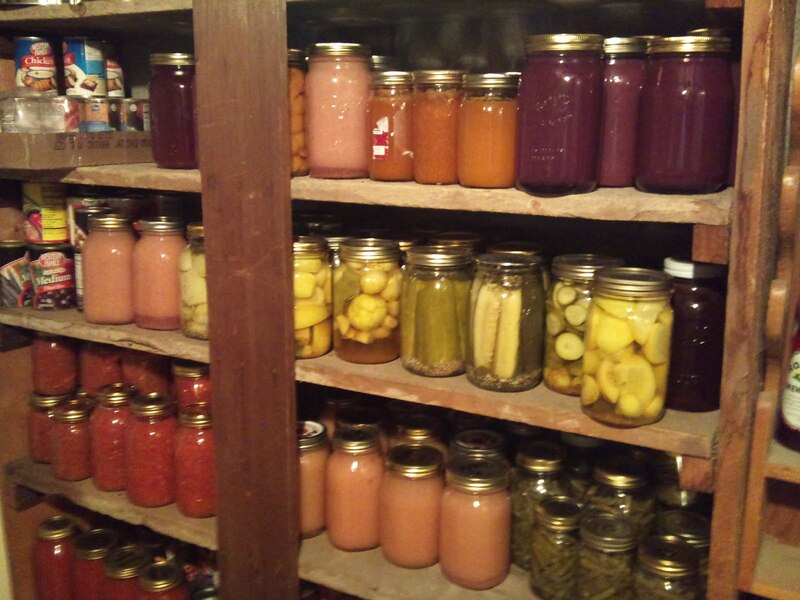 As I glanced around my pantry I started to worry that I had given away too many and that I wouldn't have enough jars for next year's harvest. Yet when I looked at the other side of my pantry where I keep my empty bottles I realized that it was filled with empty jars. Then my mind wandered back through the summer and I remembered the friends and neighbors who had brought me over the produce of their gardens and shared with me their jam, their salsa, their applesauce, their pear butter, and their juice. It is sort of unwritten "code" that if a person gives you something in a mason jar you don't have to return the jar. It is yours to fill anyway you choose and to pass on to someone else. These people had freely given me the labor of their own hands in jars they didn't expect to be returned. Those jars now filled my pantry. Waiting to be filled with next year's harvest. I marveled that somehow I had ended the season with more jars than I had started with... even though I'd given 86 of them away. I've learned there is great charity in canning jars. Each jar given away is a gift of labor and love, with no expectation of return. I think they exemplify the teachings of Christ. As Christmas approaches it is a beautiful reminder to me that when we give from our hearts, with no expectations, we always receive more than we started with. Love multiples in small little ways, day upon day, jar upon jar, until one day we look around our pantry and realize it is full. God has a strange way of doing math. It seems the more you give the more you receive. It doesn't really add up at all, but I'm not complaining. Oh, I so agree with you. I love looking around at all my canning jars sitting on the shelves. It makes me happy. I think God's math is much better than our own! I LOVE your shelves...I wish I had shelves and more importantly the room for the shelves to store things. I love to can. God does have an different math system but it always seems to work out. I love your uplifting thoughts, Heatherlady. It's fun to be instruments in Heavenly Father's hand, and have it taste good too! Beautiful post, Heather. Kind of the loaves, fishes, and canning jar post.